Polish Generals who took the command of the newly recreated Polish Army in Soviet Union after their release from Soviet prisons, August 1941. From left to right: General Michał Tokarzewski-Karaszewicz, General Władysław Anders, General Mieczysław Boruta-Spiechowicz. 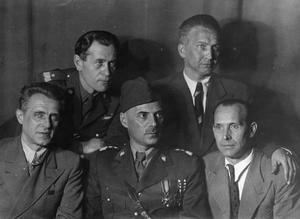 Back row: General Zygmunt Bohusz-Szyszko and General Leopold Okulicki.